From delicate curries that are infused with melt-in-your-mouth coconut cream and fresh herbs to flame scorched stir fries on fire, Bangkok’s delicacies will have your tongue dancing around your mouth and begging for more. Within the confusing metropolis of boisterous streets and flashy lights is a panoply of Thai street food that has the power to mesmerise even the most well cultured gourmets. Bangkok’s street food sanctuaries are so intense they can be bewildering to know where to get started. 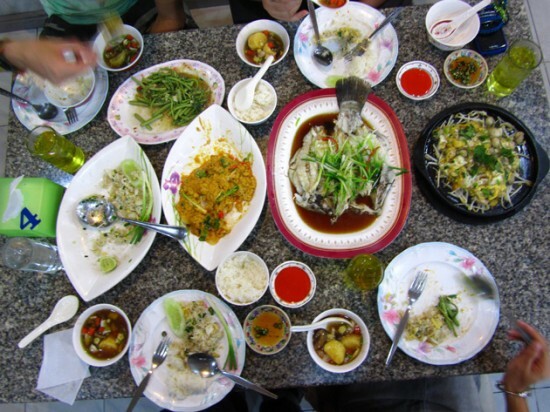 So to narrow things down let’s get into 3 different Bangkok restaurants that each serve a distinct form of Thai cuisine. General Thai Food (ahaan dtam song) is a broad genre, but I like to think of it as Thai dishes that are normally eaten with a plate of plain white rice. 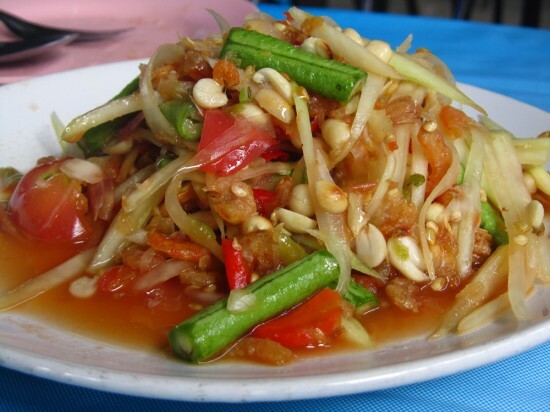 Anything from flash cooked stir fries to famous Thai curries and greasy noodles are all included within the realm of general Thai food. There’s a chain of sit down but street style restaurants located right around the Tah Pra Chan pier, adjacent to the Chao Phraya river. Among them is Lan Loong Lui, a general Thai food restaurant with an extensive menu that covers the range of some of Bangkok’s most sought after dishes. (Follow the link for the Google map of its location). 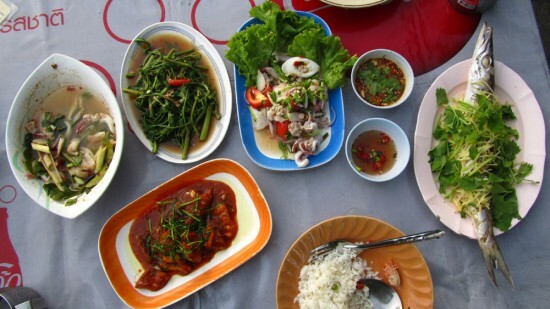 Try the pad pla keun chai (stir fried fish and celery leaves, ผดัปลาคึน่ฉา่ย), the yam takrai goong sot (shrimp and lemongrass salad, ยำตะไคร้กุ้งสด), the stir fried bitter melon leaves (pak pak yot mala, ผัดยอดมะระ) or the vibrantly aromatic tom yum goong (spicy and sour shrimp soup, ต้มยำกุ้งน้ำใส)! 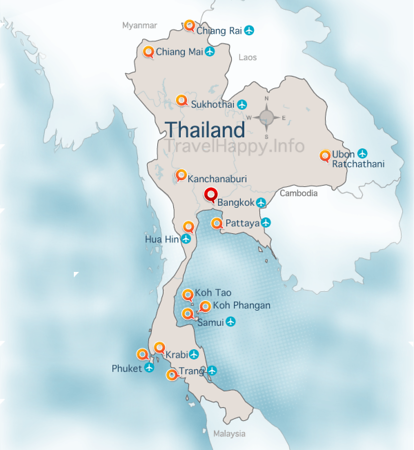 Isan is the largest province in Thailand, an area in the Northeastern part of the country that’s home to over 21 million. This vast region is well known for its local cuisine, a genre of Thai food that is identified with variations of som tam (green papaya salad), grilled meat and innards, and the undeniable staple of sticky rice. Isan restaurants in Bangkok range from plush garden patio eateries to chaotic street pushcarts that overflow with flaming chickens and shredded green papayas. Som Tam Boo Maa is an undisputed champion when it comes to Isan food in Bangkok. The restaurant is secretly tucked away on an unknown quiet street food paradise known as Bang Khun Non. The colorful menu is enough to encourage a hunger that promotes the ordering of many more dishes than can possibly be eaten. Their roasted fish (pla pao, ปลาเผา) is flawless; the firm flesh slides right off the side of the fish and the sauce will have you licking your fingers for days. Also sample the som tam Thai (green papaya salad, ส้มตำไทย), the larb moo (minced pork salad, ลาบหมู), and the yam pla duk foo (deep fried catfish fluff with tangy sauce, ยำปลาดุกฟู). There’s a universal appeal in Thailand for dining on creatures that come from the sea. Though small bits of fish or crustaceans are often available at general Thai food or Isan restaurants, if it’s the freshest seafood you crave, it’s necessary to visit a Thai seafood restaurant. An ideal location, affordable prices (for seafood), and a faithful record of creating scrumptious Thai seafood dishes, makes Kuang Seafood Restaurant one of my all time favourite restaurants in Bangkok. Some of the winning dishes include the steamed sea bass in garlic and lime sauce (pla kahpung neung manao, ปลากะพงนึ่งมะนาว), yellow curry crab (boo pad pongali, ปูผัดผงกะหรี่), and the sensational sizzling oyster omelet (or suan, ออส่วน). With an everlasting supply of Bangkok street food and never enough stomach space to go with it, it’s always a pressure filled toss-up to decide where and what to eat in Bangkok. Hungry already? Grab a copy of Mark’s Eating Thai Food Guide. The guide is neatly set up with easy-to-use pictorial Thai meal plans highlighting some of the best Thai dishes available and exactly where to get them. The guide features a mega 140+ Thai dish encyclopedia that includes the name of the dish (in English and Thai script), a photo, a description of the ingredients, an average price range, and tips for ordering. 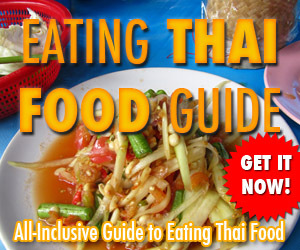 Buy the guide and get the Thai food you want to try on your plate much faster! Click Here for more information on how you can get a copy!